Small-angle X-ray scattering (SAXS) is an analytical technique used to identify differences in density within a sample with nanoscale resolution. It works by analyzing the elastic scattering angles of X-rays. 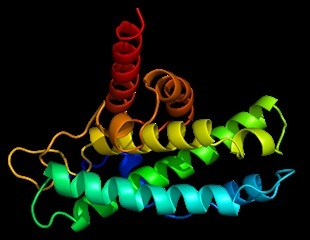 The motor protein Myo1c binds to Neph1, a protein crucial for ensuring effective filtration by the kidney, and serves as one mode of its cellular transport, according to findings by investigators at the Medical University of South Carolina and their collaborators reported in the May 16, 2016 issue of Molecular and Cellular Biology. An international group of researchers led by Carnegie Mellon University physicists Mathias Lösche and Frank Heinrich have established the structure of an important tumor suppressing protein, PTEN. Their findings provide new insights into how the protein regulates cell growth and how mutations in the gene that encodes the protein can lead to cancer. A revolutionary X-ray analytical technique that enables researchers at a glance to identify structural similarities and differences between multiple proteins under a variety of conditions has been developed by researchers with the U.S. Department of Energy's Lawrence Berkeley National Laboratory. Microvesicles are smallest cell elements which are present in all body fluids and are different, depending on whether a person is healthy or sick. This could contribute to detecting numerous diseases, such as, e.g., carcinomas, at an early stage, and to treating them more efficiently. The problem is that the diameter of the relevant microvesicles generally lies below 100 nm, which makes them technically detectable, but their exact size and concentration hardly possible to determine. A new device is now to provide the metrological basis for these promising biomarkers. Bruker AXS GmbH announced today that it has acquired the assets of Hecus X-ray Systems GmbH, a company focused on analytical instrumentation for Small Angle X-ray Scattering (SAXS) based on advanced Kratky technology. Bruker Corporation and Lawrence Berkeley National Laboratory (Berkeley Lab) today announced a collaboration to develop and distribute new structural biology methods and tools to integrate Small-Angle X-ray Scattering (SAXS) with Nuclear Magnetic Resonance. Researchers including members from the Niels Bohr Institute at the University of Copenhagen have developed a new method for making detailed X-ray images of brain cells. Scientists have acquired a more dynamic picture of events that underlie the functions of a bacterial biological clock. Scientists investigating an important DNA-repair enzyme now have a better picture of the final steps of a process that glues together, or ligates, the ends of DNA strands to restore the double helix. Structural changes in proteins can now be seen in increased detail, using a new application of an existing technique. The application, developed at the U.S. Department of Energy's Argonne National Laboratory, could help produce lead drugs for disease therapy.